Our #SundaySupper group has an outstanding theme for this weeks event. We have partnered up with Chantal Bakeware to #BakeForACure!! Chantal has been following the Sunday Supper Movement and loves our mission. 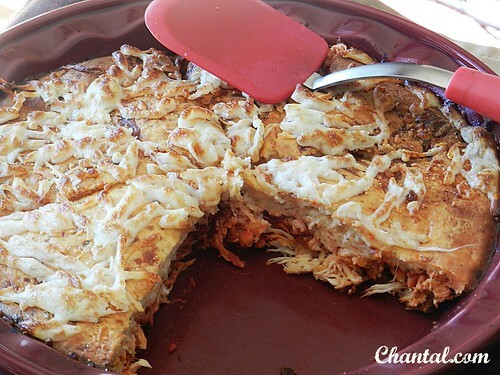 I am honored to have received Chantal’s newest addition, the Easy As Pie Pie dish. The whole entire #SundaySupper team is reaching out to promote this awesome new product and also to work with Chantal to encourage everyone out there to #BakeForACure. Isabel from Family Foodie is hosting this week! Let’s all thank Isabel for arranging such a great theme!! 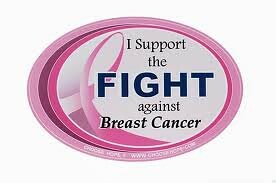 October is Awareness month, not only for Breast Cancer Awareness but just awareness. Why not get the creative/baking juices flowing and cook up something for someone in your life that has been touched by Cancer. I myself lost my father at 22 years old to Lung Cancer. Anyone who knows me knows that this forever changed me. 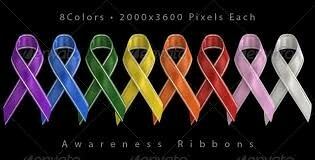 Though I don’t live in the town where my father received his treatments anymore, when I heard about this event I had to take part for so many other reasons. So if I can’t bring a baked good to his treatment facility to thank all of the wonderful people that had the pleasures of knowing my dad, I can still make something in honor of him, my grandmother who is a breast cancer survivor and my Mother-In-law who was touched with Breast Cancer late last year. She is on the road to recovery now but it made our once weak relationship a very strong relationship. Over the years I’ve watched many people loose loved ones to this horrific disease and I’m honored to take part in an event that stands for a, well A CURE!! To support such a fabulous cause Chantal Bakeware is offering a discount!! Yes!! 20% OFF OF ALL Chantal Pie Dishes. Please enter BAKE4CURE at the checkout point to receive this more than generous offer. This is active October 16th through October 30th. 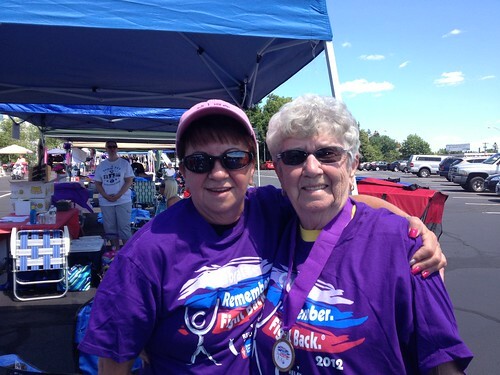 Here is a picture of my MIL and my grandmother walking the Relay For Life this summer, I had never been to such an emotional event before. When trying to choose a dish I did a lot of thinking because I’m not the world best baker in the world, and a pie, I don’t even think I’ve ever made a pie, but I do make things in a pie dish a lot so I had no problems finding something. I chose a main entree dish just to change it up a bit. Heat oven to 400ºF. Grease 9-inch pie plate. Sprinkle Parmesan cheese in pie plate. 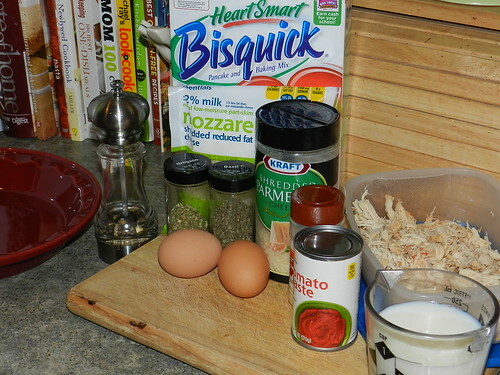 Mix chicken, 1/2 cup of the mozzarella cheese, the oregano, basil, garlic powder and tomato paste; spoon over Parmesan cheese. Stir Bisquick mix, milk, pepper and eggs until blended. Pour over chicken mixture. Bake 35 minutes. 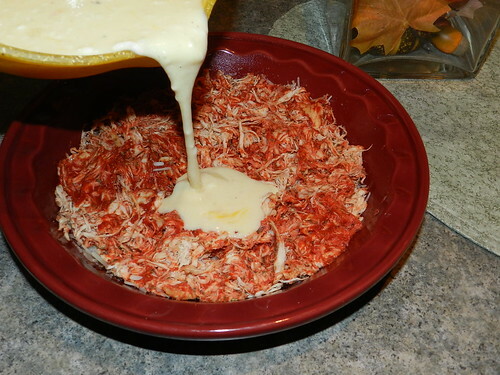 Sprinkle with remaining mozzarella cheese. Bake for another 5 min or less. Cool 5 minutes. 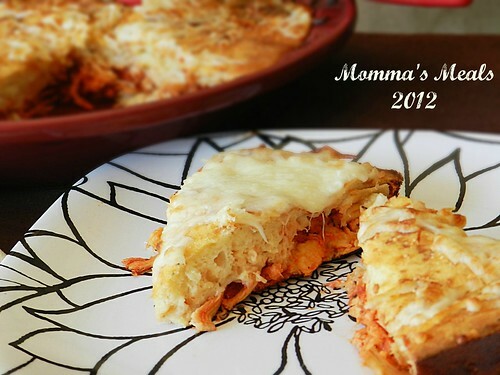 I absolutely love this dish, it’s thicker than my other pie dish I have and well it’s pretty!! Now lets see what our other fellow #SundaySupper goers have cooked up for this heart touched theme. Join me in reading these stories and how something so simple can touch a life. Don’t forget join us on Twitter throughout the day during #SundaySupper. We’ll be meeting up at 7:00 pm(Eastern) for our weekly #SundaySupper live chat where we’ll talk about our favorite Comfort Food Recipes. All you have to do is follow the #SundaySupper hashtag or you can follow us through TweetChat.